You have to be a seriously annoyed Nissan customer to go to the lengths this guy went to. Firstly, he had to pay around R2000 to place this ad in Noseweek, and he had to arrange the wording and so on. He is clearly fed up with the way that CMH Nissan in Midrand treated him. I had my Daewoo serviced by them, before and (only once) after the cylinder head gasket blew. 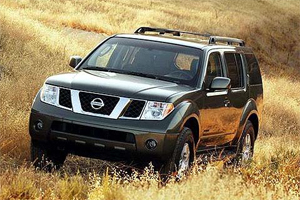 Ivan Visée was very happy with his Nissan Pathfinder until the day came when he wanted to drive it to Cape Town. 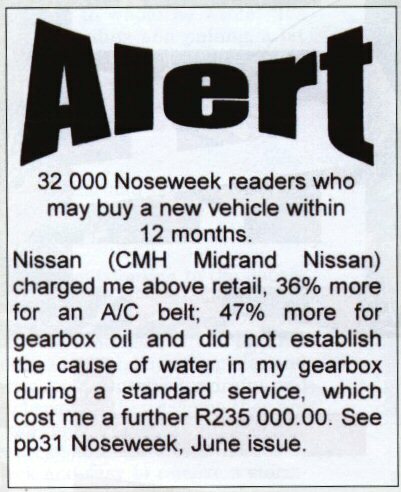 In preparation for the trip, he went to CMH Nissan in Midrand and asked them to give the vehicle its 120,000km service. In the course of the service they phoned him to say there was water in the gearbox oil. Had he driven through any rivers lately? No. Consequently, they merely changed the oil - at quite a considerable price: far higher than the oil available elsewhere - so CMH Nissan was putting a high premium on it. Visée took delivery of his vehicle and headed for Cape Town, only to have the motor blow up on him 60km short of the Mother City - just as he was about to enter the Du Toit's Kloof tunnel. The SUV was then towed to Droomers Nissan in Paarl, which offered Visée the unappealing choice of either waiting three months-or-so to have his engine and gearbox reconditioned, or to have a new engine put in at a staggering cost. Visee realised that the differential cost between a new and a reconditioned engine was not that much, so he opted for the new engine. At this stage he was unaware of what had caused the disaster. Only after Droomers had taken the engine out to replace it with a new one did he realise that the damage to the gearbox and engine had resulted from a leak in the gearbox oil cooler. Surely, once CMH Nissan realised that he had not gone through a puddle, a pond or a river, they should have looked a little further and done a pressure test on the only other possible source of water in the oil, namely the cooler, which runs into the radiator and circulates the oil through the cooled water of the radiator. Their failure to do the check and pick up the leak was cardinal in causing the subsequent blow-up. Visée employed forensic scientist and negotiator Dr David Klatzow to engage with Nissan SA on the matter. Klatzow met Nissan's representative and their attorney in Durban. He described their attitude as "cavalier" and "couldn't care a damn". The best they were prepared to offer Visée was a derisory R20,000 refund on a bill which came closer to R200,000. They blamed Visee for not having picked up the fault earlier - while, of course, excusing their own supposedly professional dealership for not having detected it. The mind boggles. I showed the ad to the guys who do my car servicing and they scratched their heads in amazement. You would think that the motor industry would have learnt its lesson by now, but no, they think they can ignore their customers indefinitely. Nissan just needs to lose a few sales as a result of this saga to kiss that R235000 tax-deductible "loss" goodbye. Not very bright. Their ratings on HelloPeter are not very good when it comes to servicing either.